A raw, unflinching and emotionally devastating examination of human relationships at their most intimate and profound, Michal Haneke’s Oscar and BAFTA-winning Amour (2012) focuses upon the lives of an French elderly couple and the strain their relationship undergoes after one of them suffers from a stroke. To celebrate the DVD and Blu-ray release of one of last year’s finest films on Monday 18 March, courtesy of UK distributor Artificial Eye, we have THREE DVD copies of the film to offer to our arthouse-admiring followers. This is an exclusive competition for our Facebook and Twitter fans, so if you haven’t already, ‘Like’ us at facebook.com/CineVueUK or follow us @CineVue before answering the question below. 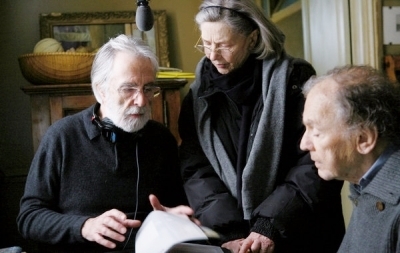 Two-time Palme d’Or winner Haneke (The White Ribbon, Funny Games, Hidden) returns with his most moving film yet, Amour. Starring Jean-Louis Trintignant, Emmanuelle Riva and BAFTA award winner Isabelle Huppert, the film is an intimate account of an elderly couple facing their greatest challenge in the twilight years of their lives. Georges (Trintignant) and Anne (Riva), two cultivated, retired music teachers, are in their eighties. Their daughter, also a musician, lives abroad with her family. The couple’s bond is severely tested as Georges and Anne face up to a sudden turning point in their lives. What nationality is austere Amour director Michael Haneke? Michael Haneke’s Amour is available to own on DVD and Blu-ray from 18 March, courtesy of Artificial Eye. The competition closes at 6pm on Thursday 21 March, 2013.